Seriously. 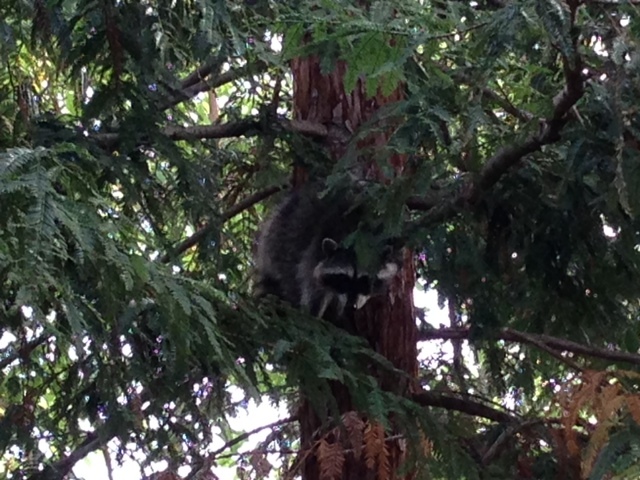 2 pm on a Sunday, little Mr. Raccoon sauntered through the yard, not scared at all, climbing up the redwood tree to watch me curiously. 2 pm! Broad daylight! Sigh. We have a bit of a problem. Not sure what to do. Urine and cayenne have been suggested. I’ll try anything. Needless to say, Thomas’ adventures for the day were curtailed. K. had a class to help with today so I had a day to myself. I made a big list of what I could do, ranging from the incredibly lazy (lay on the couch reading all day) to the overly-ambitious (disassemble the dining room to put down the new/old Persian rug my dad handed down to me). I’m sort of carrying over some of the Halloween spirit into November. I’m finishing up a James Herbert book (Others) and we’re watching some really great classic horror/scary movies. Last night we watched The Changeling (with George C. Scott); it was actually really quite good. I was impressed. We also watch Burnt Offerings a few weeks ago: that was the complete opposite. Cheese-o-rific. Oh well. This year I finally got a white Christmas tree. I’ve wanted a white or silver tree for many many years, and this year I finally found one for the right price, that was the right size (6.5 ft) and it’s perfect. I love it. I’m actually excited about Christmas this year. I felt inspired to decorate a little. We have some fun plans involving San Francisco light-display touring and a dinner out and going to see the lights at the zoo. Everything feels celebratory and happy, not obligatory and stressful. This is pretty nice, I have to say. Some other photos to catch you up on where I’ve been… This takes us from Muir Woods and the Pelican Inn when Tammie came to visit at the start of November, to San Francisco (Sutro Baths and an otter spotting! with Tammie as well), to driving home from Oregon, to the Santa Monica trip, to autumn in the backyard, finally wrapping up with some cute Thomas shots. It’s been so busy, but good. I continue to be so grateful for my current life. Next post: Books! After a long week (why are some weeks so much longer than others? ), it’s finally the weekend! 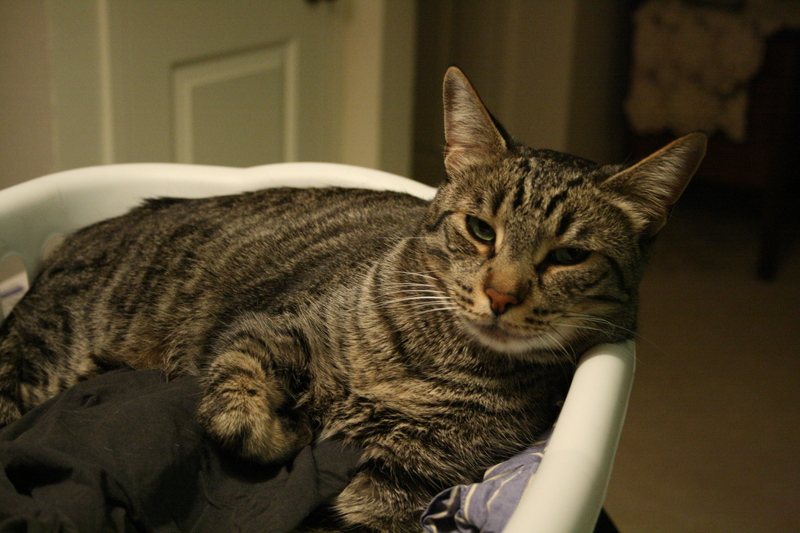 Sir Thomas Tigger Tiger Tikky is feeling much better these days. He had some problems with anxiety and some bizarre symptoms related to that, but I’ve been doing “play therapy” with him every day (10 minutes with the Da Bird feather flyer seems to do it!) and that seems to be making a difference. 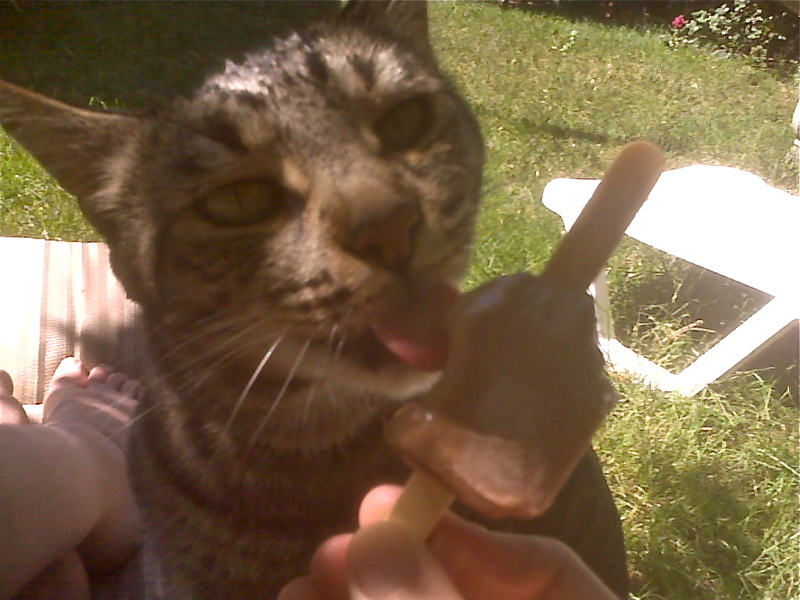 He LOVES that thing. 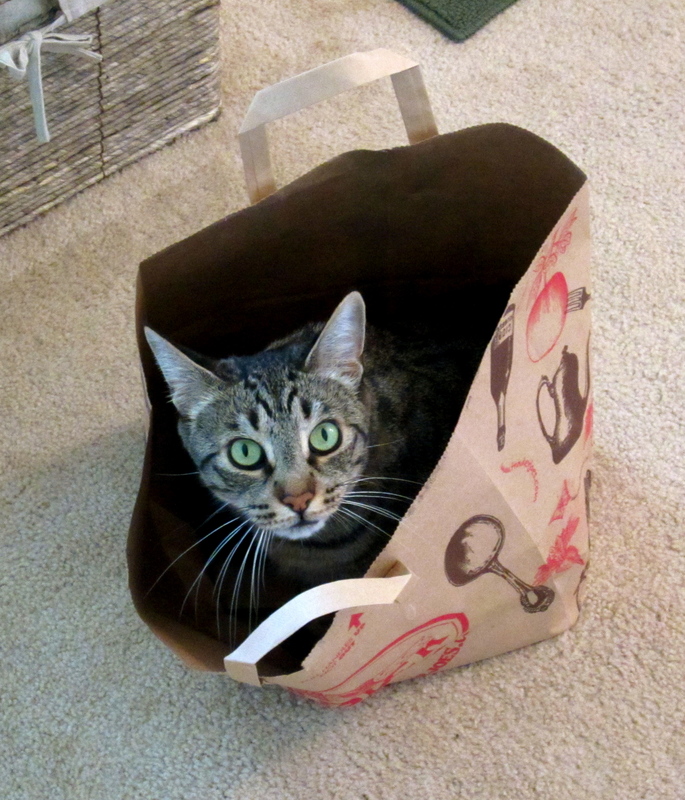 He is also a big fan of paper bags. He gets to go outside with me (supervised) and ever since his late-night adventure, he’s shown much less interest in whatever is over the fence. Sometimes he races around the yard at full-tilt speed, tail straight up, leaping and bounding over the grass. He looks so happy. I’m so glad he is here with me. My garden is doing well although I’m puzzled by some things. The lemon cucumbers did not do well at all. I think I started them too late. I have ONE lemon cuke (one cucumber… three plants! So sad!). I’m glad the others that I had (which I planted from starts, not seeds) did well. 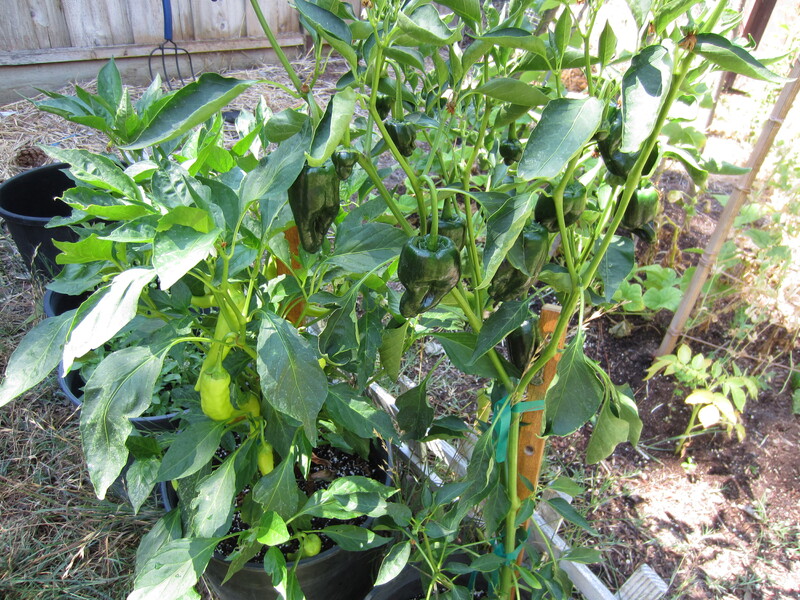 The zucchini continue to do well (of course) and my chili peppers did quite well too. Not sure what I am going to do with them. We’ll see how the tomatoes continue to do — I might do a batch of salsa and use up some peppers, or I might get crazy and make up a batch of homemade hot sauce! 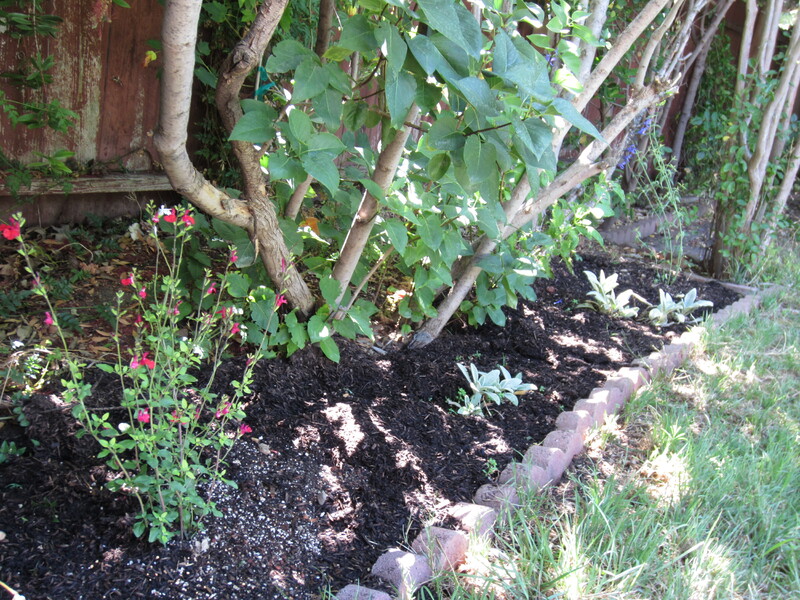 I decided to plant a winter garden: kale, chard, some lettuce and some Napa cabbage. I’m not sure how it will go — I think I need to do some soil fortifying before I plant the seeds. The beans are about ready to come down and I have half a garden plot ready to be planted as well. The rest of the garden is still growing well enough so I’ll leave it. I am not sure — do I plant starts in little seedling cups now, since I have to wait for the rest of the garden to finish before replanting it? Time to do a little garden research. I did have a bunch of tomatoes today and although I’ve been eating caprese salads almost every night for a few weeks now, I wasn’t making a big enough dent. So it was time to can tomatoes! I canned salsa last year but this was my first attempt at just tomatoes. I opted for a hot-pack, with crushed tomatoes. I got six pints this time around but there are plenty of tomatoes on the vine, so hopefully I’ll have lots more to can. I’m tempted to go up to Brentwood and get some more tomatoes just to can to have on-hand over the winter, but the pioneer in me wants to just can only what I grow myself. We’ll see. Maybe a late-season harvest, when they want to get rid of al the tomatoes and are selling them cheap. If I don’t have enough. 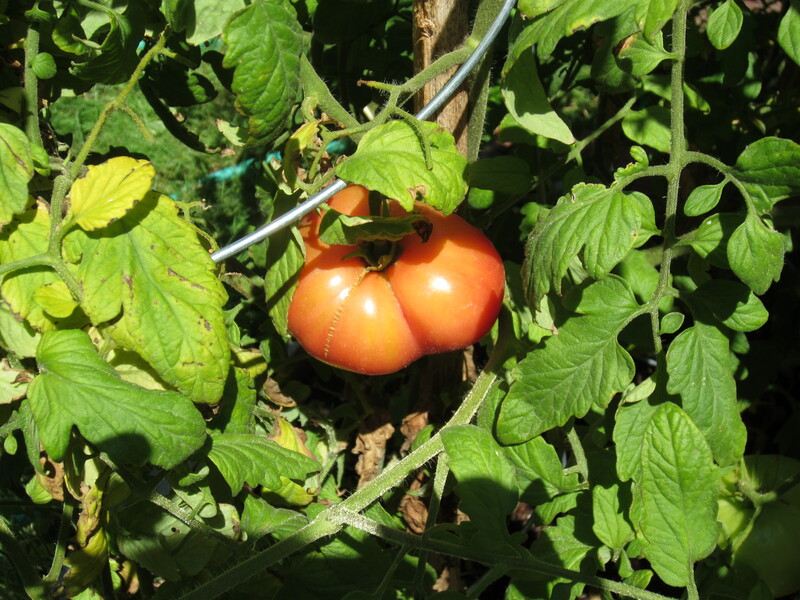 Last year I was still gathering tomatoes well into October, so we’ll see. Not as hot lately, which is nice. It’s been 95-100 degrees for a few weeks and today it was around 80 — so pleasant. I got my copy of Gone Girl from the library and I am SO EXCITED. I think I need to stop writing now and go read. It’s a 7-day loan so that’s my excuse to pause my other reading and dive right in. Oh, July. Wow, it is flying by in a huge rush. I will be leaving again soon for my brother’s wedding, and so there’s been a mild flurry of last-minute activity on that front. It’s been very fun to get to help with invitation and wedding stationery needs (menu, program, etc.) Sometimes that graphic design degree comes in handy… And I’m working on a Super Sekrit project that I MUST get done this weekend. Thomas recovered from his adventure, only to go on another adventure to the vet on Monday. Time for vaccines and to get microchipped. He is always such a good kitty at the vet (although the car ride completely stresses him out). Unfortunately the vaccines made him extremely lethargic, so for the past two days I’ve been worrying over him. Thankfully, today when I came home I first noticed that all of his food was gone (which hasn’t been the case for quite a few days) and then he came sauntering out, not exactly frisky, but certainly looking more like himself. Which is good on many counts, particularly because he needs to be healthy while I’m gone! On the book front, I’ve been reading all of the L. Frank Baum “Oz” books on my Kindle. I read most of these when I was a kid — our library had a terrific collection of them, all very old, with big thick covers and wonderful illustrations. I haven’t read them since, but all of the amazing characters are coming right back to me. I think these books are brilliant and my brother and I both absolutely adore them. They’re free on the Kindle and I thought since I finally finished all the March sister books (Little Women, Little Men, Jo’s Boys) I’d move on to these. They really don’t make children’s novels like this anymore — the crazy imagination, both innocent and yet fraught with real danger. The lovely language and careful attention to description. I just love them. I’m also reading The Family Fang for bookclub — it’s pretty terrific so far. I can’t wait to talk about it. My reading this year has been really bad, but part of that is because for the first 2-3 months of it, I was half paralyzed and could hardly read anything. Oh well. Life’s pretty good. I’ve been having a hard time sleeping lately — not sure what is up with that. Spending time with friends as I can — I still have no friends out here, but I’ve managed to wheedle some friends out here for visits. Enjoying gardening, trying to stay present in the moment as much as I can. The T. stuff still comes up and trips me sometimes — I’m getting lots better at deflecting the guilt and responsible feelings, but they still get me. Thankfully I have some wonderful friends and guides to help me when I lose perspective. keep the yard somewhat under control. keep the house clean (ish). keep myself and the kitty healthy. do what I want to do, and don’t do what I don’t want to do. make small improvements as I see them (to self and property). That last one takes some getting used to, but I’m working on it. Actually that’s a pretty good list for anytime. It’s not perfect, but overall things are really good, with some genuinely wonderful parts. I’m so grateful that I get to experience those again. It’s pretty much a miracle that I get to have this second chance at life. I hate to characterize the last few years as anything other than “just doing what needed to be done, and with love” which it certainly was, but it was also pretty hard on this here girl. I can take care of myself now, and that’s really good. Thomas is back inside where he belongs. He does not agree with me on this point. Yesterday I went to the nursery and had some fun. Salvias, geraniums, so many pretty things. I had to really think hard about each plant or I would have gotten far too many. Geraniums under the bedroom window. I’d like to do something climbing here eventually, but not sure what. In the meantime, geraniums are pretty and easy. 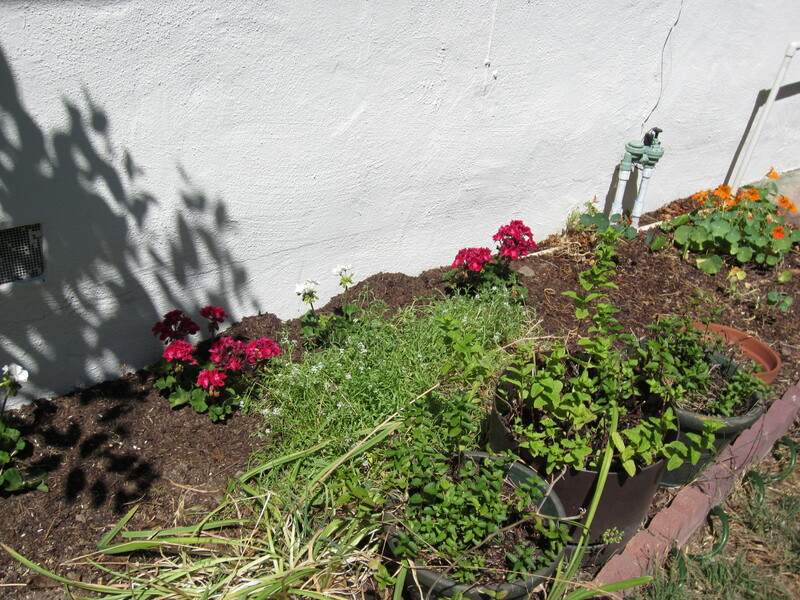 They join the volunteer alyssum patch, nasturtiums and pots of mint. 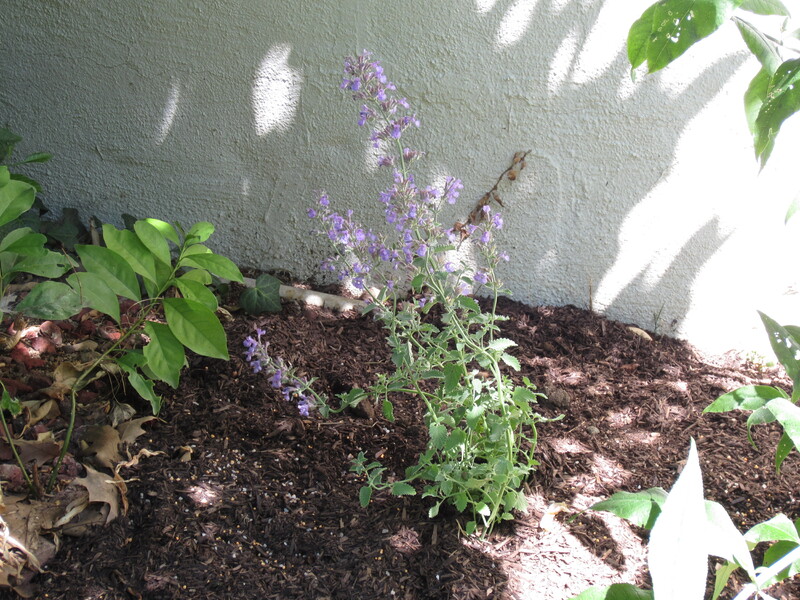 Under the lilacs: hot pink and blue salvia, lamb’s ear, and some tall apricot-flowered thing that I forgot the name of. 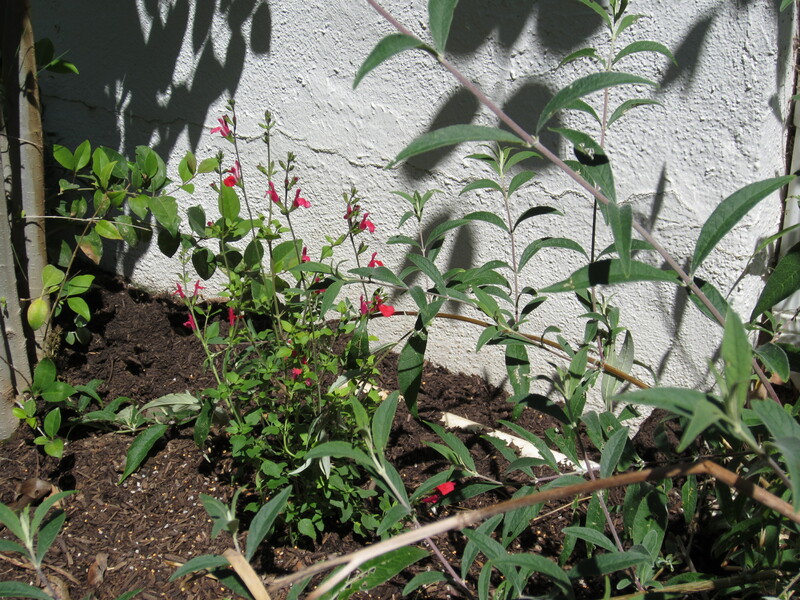 More of the pretty pink salvia to join the hummingbird plant, which is huge and leggy and needs to be trimmed back. 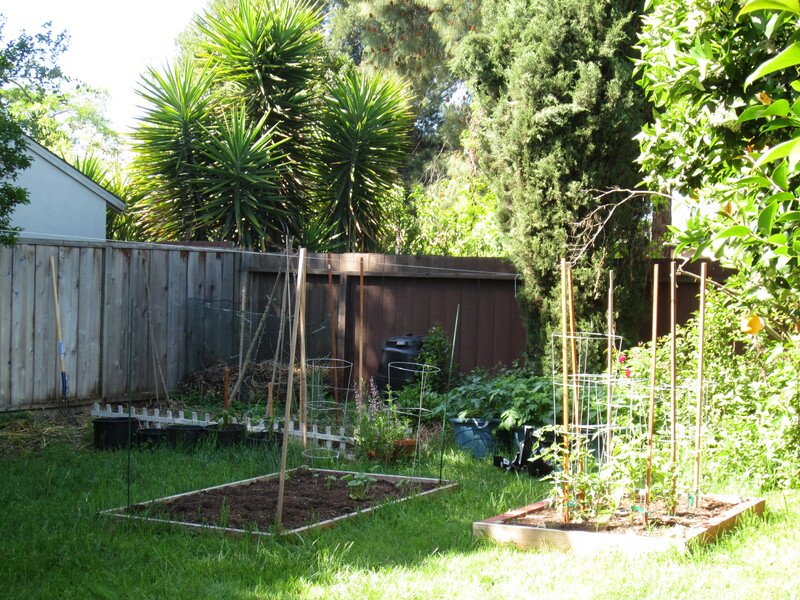 The vegetable garden. 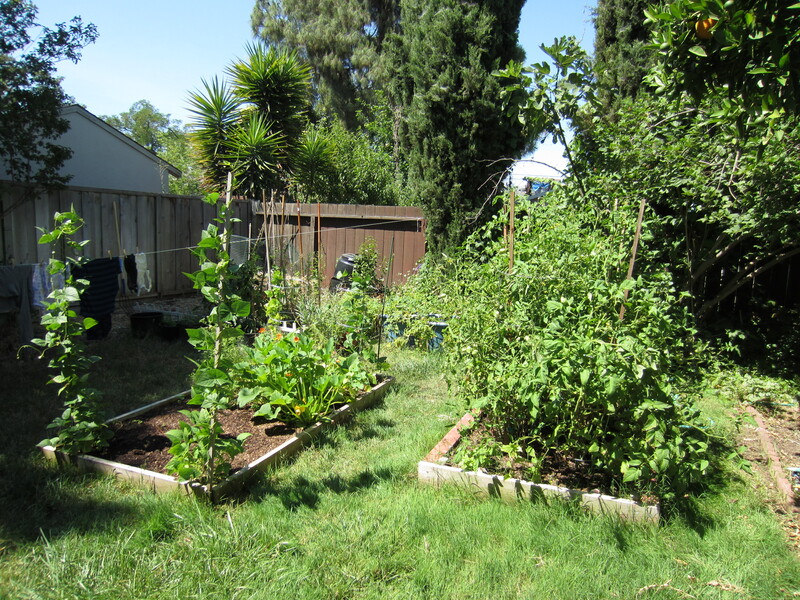 The lettuce (blank patch in front on the left) was a total failure this year, but everything else is doing well. The right raised bed is all tomatoes, which are doing fantastic and I’m soooo excited about them. Zucchini is doing wel, cucumbers are starting to produce, potatoes seem to be okay, beans are climbing, peppers are going gangbusters. 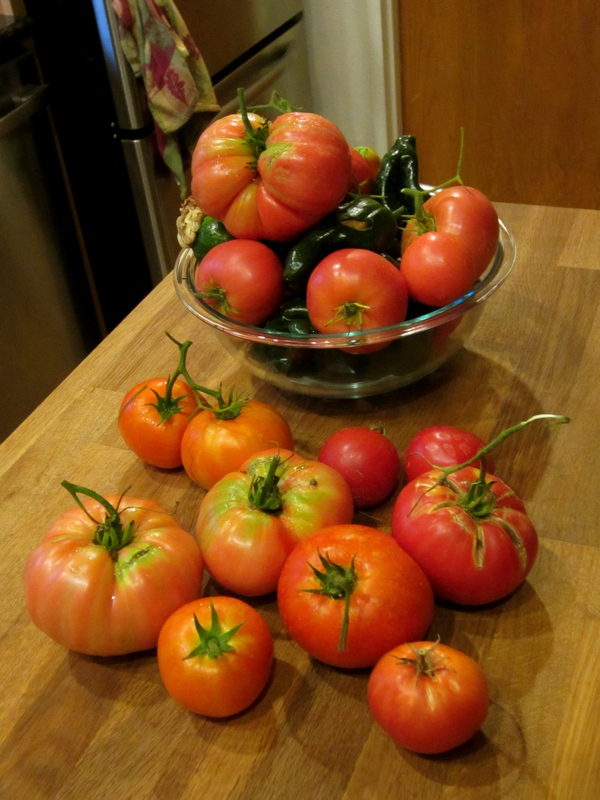 Of course, with tomatoes like these, the obvious answer is salsa! 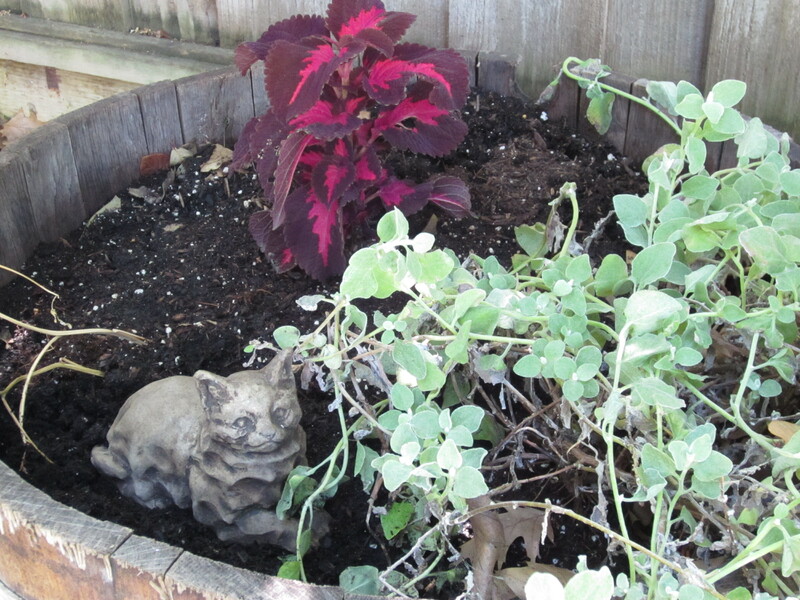 Not forgetting beloved kitties at rest, I put this pretty coleus in Cleo’s wine-barrel grave planter. Miss my sweet kitty girls so much. 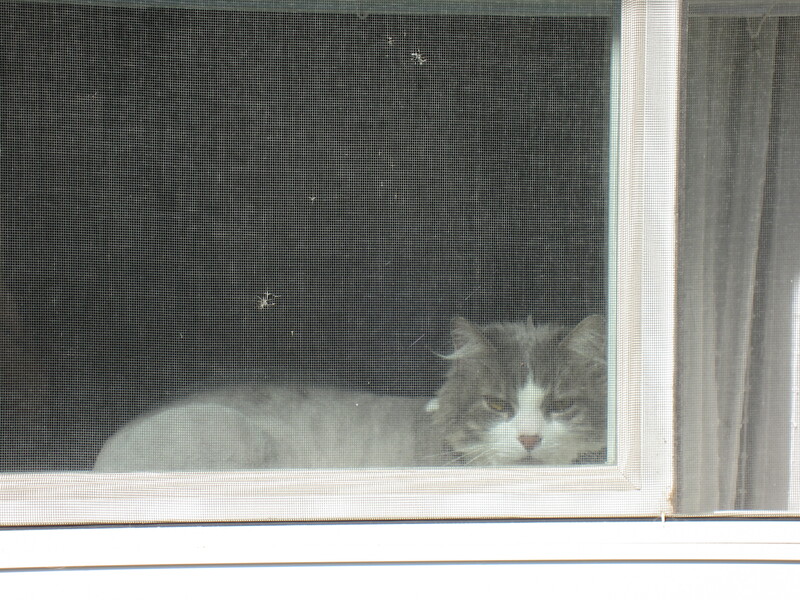 Thomas watches all of this, giving me his opinion about staying inside more now. He got to come out for a bit earlier. He was very good, just stayed in the yard, and then went back in the house on his own. I don’t think he’s very eager to explore outside the yard for awhile. I made it home. Three days of reunion plus one day of shopping plus one day of work plus one day of travel = tired. But, it was all fun and wonderful and I enjoyed all of it. The weather was perfect, the friends were wonderful, the shopping was successful, the work meeting was interesting, and the travel uneventful. What more could you ask for? I got home and of course Sir Thomas was delighted to see me, and wanted outside. He’d been naughty and scared the catsitter by climbing a tree, so he hadn’t been allowed out again, and so he was all cabin-fever kitty. 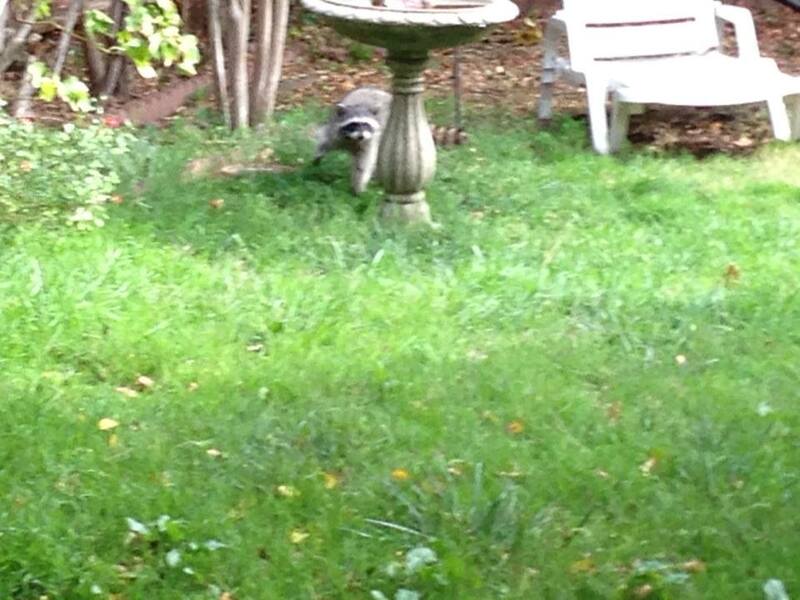 I let him out, and he meandered in and out until around 8, when I went outside to water the garden. I went back inside and got involved in a project, and at around 8:45 realized that Thomas needed to come in. Well. I called and called and called, and usually he comes right away when I call. But this time he didn’t. 9 o’clock… 9:30… 10 o’clock… 10:30… at around 11 o’clock I seriously started getting worried. I’d been out every half-hour or so, calling and calling. Wandered around the neighborhood looking for him, etc. I finally stopped calling for him at around 11:30 because I couldn’t call out without sobbing. At midnight, I left the back door open and went to bed, because there was nothing else to do. 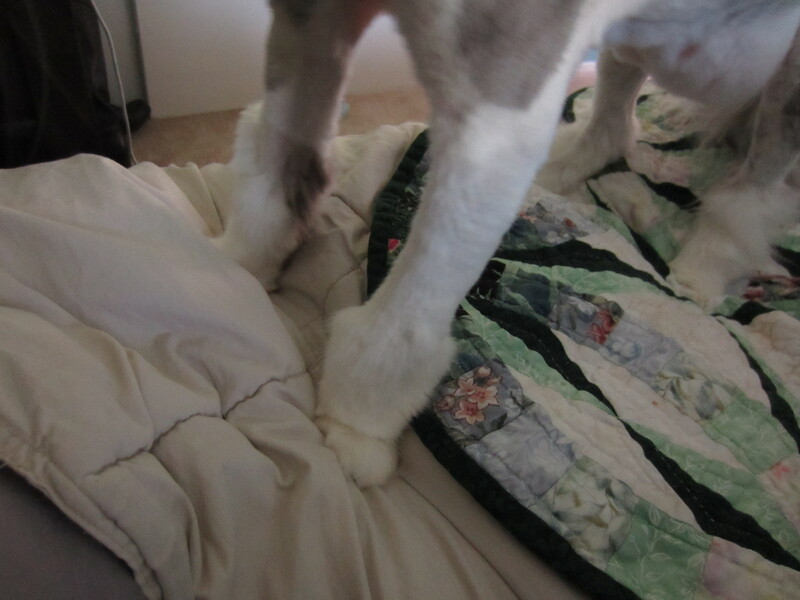 I prayed that I would feel his familiar weight jump up on the bed to wake me up. I dreamed that he came home, and I was so happy. Then I woke up — but still no Thomas. It was 1:30 am and I was just frantic. I got out of bed, got dressed, went for another neighborhood walk, came back and wrote a “Lost Cat” craigslist posting, fretted, cried, prayed. Went back to bed at around 2:30 or so, imagining the worst, trying to keep it together, trying to have faith that he would show up for breakfast. Finally we both settled down and got a little bit of sleep — my darling kitty tucked in tightly beside me, completely worn out from whatever adventure he had been on, and me, still vibrating from the fear and worry, but exhausted from the long night. I haven’t felt that terrified and helpless since I don’t know when. I was positively sick with worry. I’ve been carrying around this horrible bereft feeling all day — even though he came home (again, thank you dear God!! ), it was so awful when I thought he might never come home. I didn’t know what I’d do if I woke up in the morning and he still wasn’t home. But thankfully he IS home, and he will be staying inside for awhile. I am going to look into making a secure cat-run in the alley by the side of my house, with a cat door so he can safely come and go as he pleases (to a contained enclosure!). 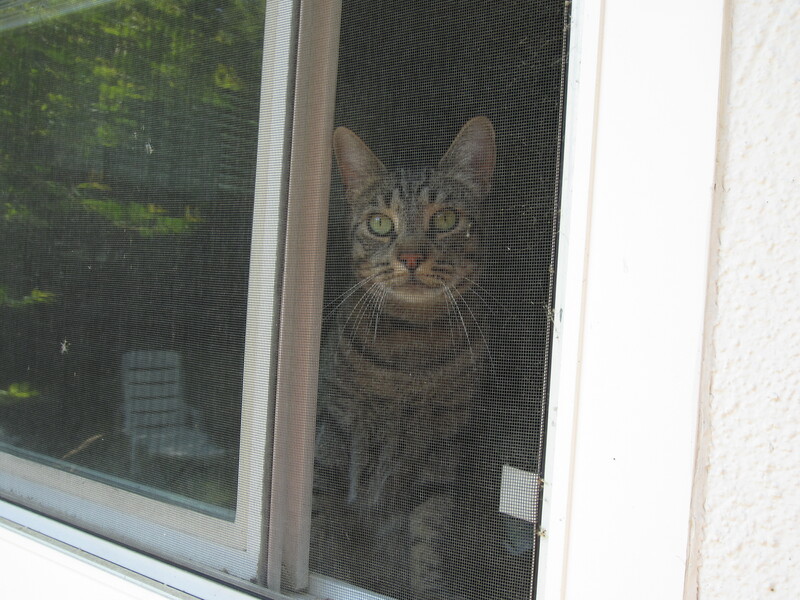 In the meantime, when and IF he gets to go outside again, I will be carefully monitoring him and bringing him back with me when I go back inside. He usually just stays in the yard, so I don’t know what made him jump the fence (if indeed that’s what happened — for all I know, he was under my own house), but that was a really horrible experience that I never want to repeat. And yes, he was wearing a collar with a tag, and yes, he will be getting microchipped this Monday. I know that all’s well that ends well, but that little kitty means the world to me and I couldn’t stand it if he didn’t come home. The rest of the weekend was a good mix of getting some stuff done, some napping, some relaxing. I rode my bike today, did some reading, etc. I’m reading Postcards From The Edge. I don’t really get it. I’m not really into it. But it’s short, so I’ll finish it. But I don’t get it. Is it an 80s thing? It’s… almost boring? I don’t get the drama or the humor. Maybe that’s a good thing, considering the subject matter. It’s just me and Thomas in the house now. T. found a place, and she already has Chelsea. She had asked for Finn way back in November, but couldn’t take him until now. Yesterday she was finally ready for him so I packed him up and drove him to her house. It’s quite far away, at least an hour, and we got lost and he was yowling the whole time. I was sad, but I know he is going to have a really good life with her. He and Thomas couldn’t ever get along (two adult males, one alpha and one clearly terrified of other kitties) and neither of them were happy with the arrangement I devised: a gate, literally in the middle of the house. Thomas had the front half, and Finn the back. It worked all right except that one kitty was always on the wrong side of the gate (whichever side I was not in). Either Thomas would sit at the gate and cry and bite the bars, or Finn would huddle next to the gate and look longingly through the bars and squeak pitifully. It was heartbreaking and stressful for all of us. Now he will have the whole apartment to himself and someone to love him all day long. He’s going to be very happy. T. says he’s already settling in like he’s been there for years. So I’m not as sad as I might be otherwise; I know he’s truly getting a better life than I could give him, in the current circumstances. 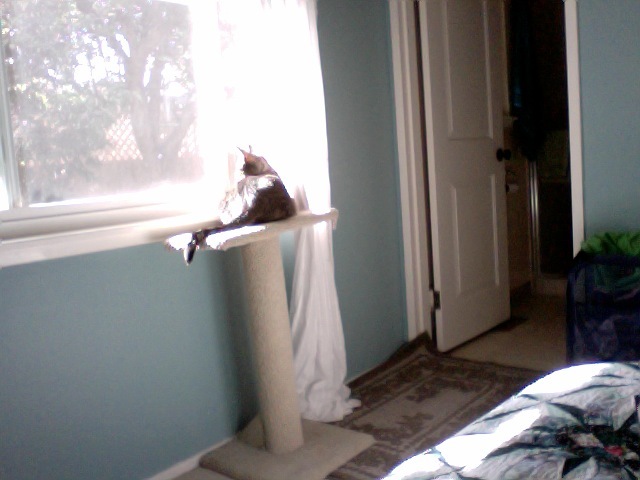 Cat perch, in the sun, in the bedroom, next to a slightly opened window, looking out at birds. It doesn’t get much better. 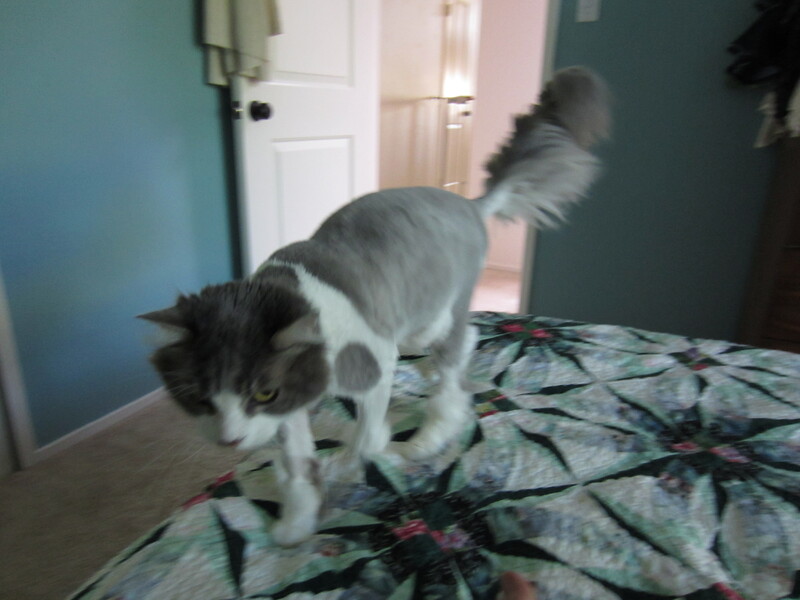 He has hurt himself slightly — his tail isn’t working right. He has Erect-tail Dysfunction (oh, I kill me). It’s getting a little better but if he continues to have problems I’ll take him in. He seems okay, but his tail isn’t, well, perky. I think he hurt himself sometime in the last couple days. I’m exhausted. Two weekends away, cleaning out my dad’s attic (I need to do a blog post about my treasures! ), kitty transfer… this weekend I’m planning on making some orange marmalade and organizing the garage, but I don’t know how much of that will happen. I might… well, stay in bed. Finn is continuing to look adorable with his little cut-velvet suit and boots. So soft. 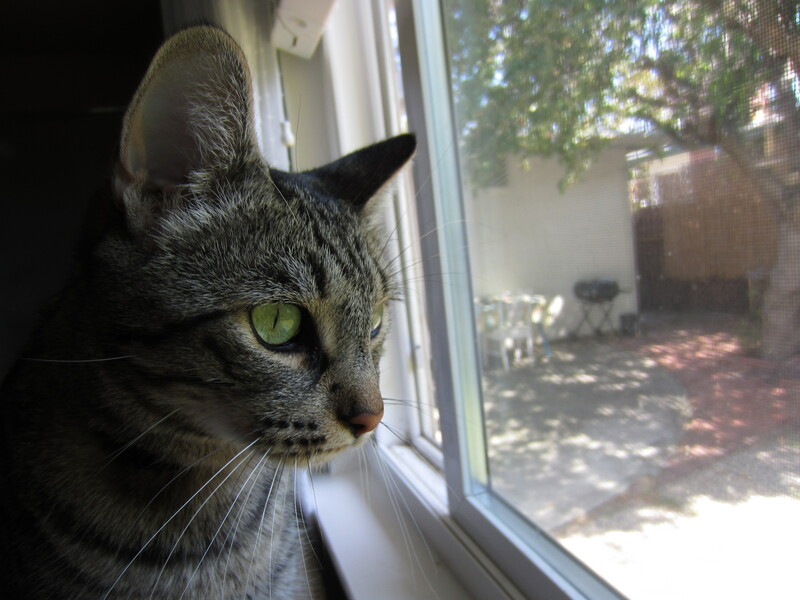 I think T. just got an apartment so my time with him is limited (he will go live with her), which makes me so sad. I have tried very hard to think of him as my “foster kitty” and not get too attached, but of course that is futile and he’s got my heart. I will miss him. T. is of course an excellent kitty-parent and he’ll be loved and pampered and get tons more attention than I can give him, but I am still sad and will miss that little fluff. It will be nice to have the house not divided, of course (the kitties don’t get along and I have a gate in the hallway to keep them separated, which nobody likes). And Thomas will have the full run of the house again, which he’ll love. It’s best for everyone. It’s still hard, though. That Finn is so darn adorable. Right now he is curled up on the bed with his whole face buried in his fluffy tail. 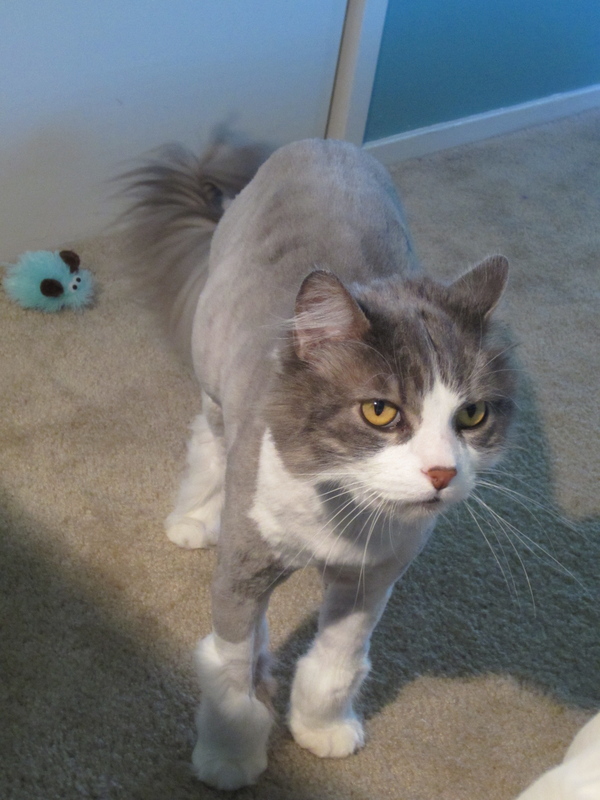 I think he’s been cold since his haircut. So, pretty soon, it will be just me and Thomas in the house. As much as I’ll miss Finn, I’m looking forward to not having to divide my time between the two kitties; no matter where I am, someone is unhappy, and that has been a little difficult. Thomas is a good companion and now that he’s able to be outside with me, that little puppycat and I will spend lots of time together. I’m so glad I have him. Such a good boy. And so… energetic! Watered the garden. Grow little tomatoes, grow! Finn watching through the window. 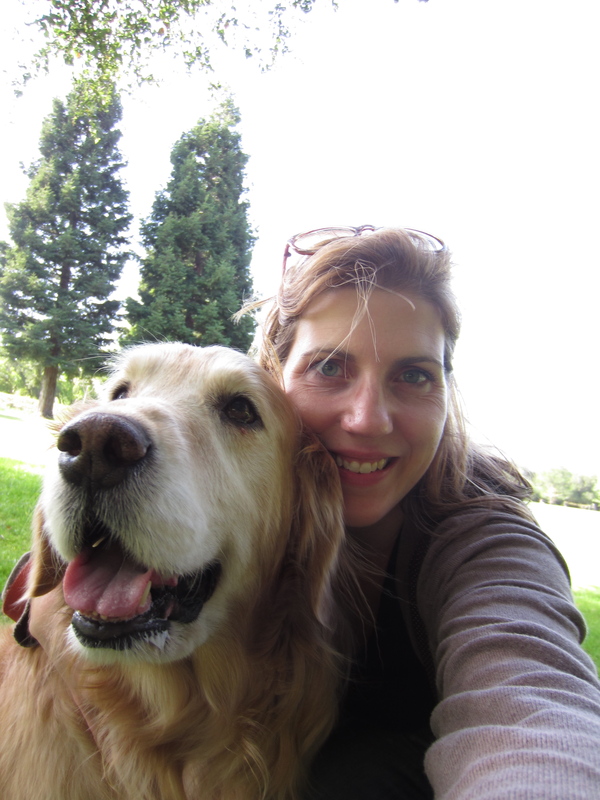 Such a good, sweet, adorable, gentle, best girl ever puppydog. 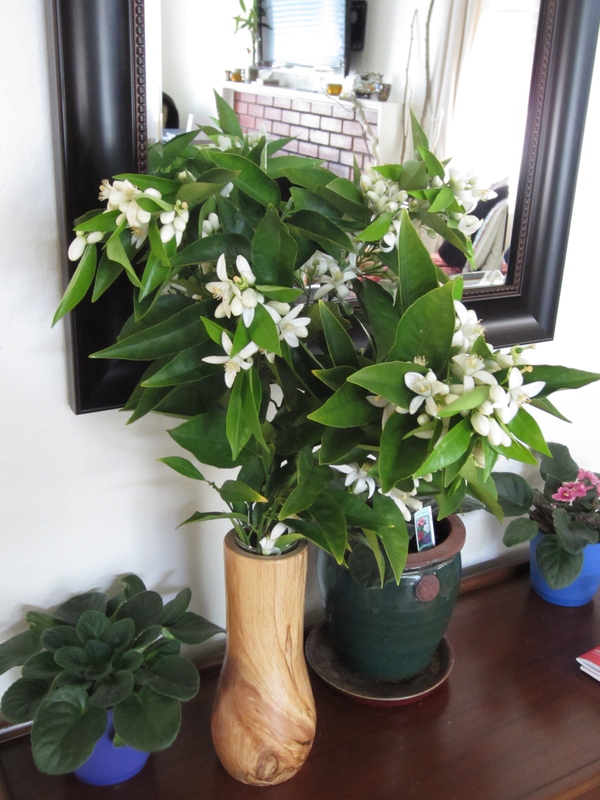 Back home to enjoy those orange blossoms some more. Amazing scent. Kitty who won’t stay still long enough for me to get a photo. Russian fur boots. So cute. Sorry, no Thomas pictures today. It was good to see the doggie. What a good girl. I’m glad she’s with T. — she is obviously very well cared-for and loved. 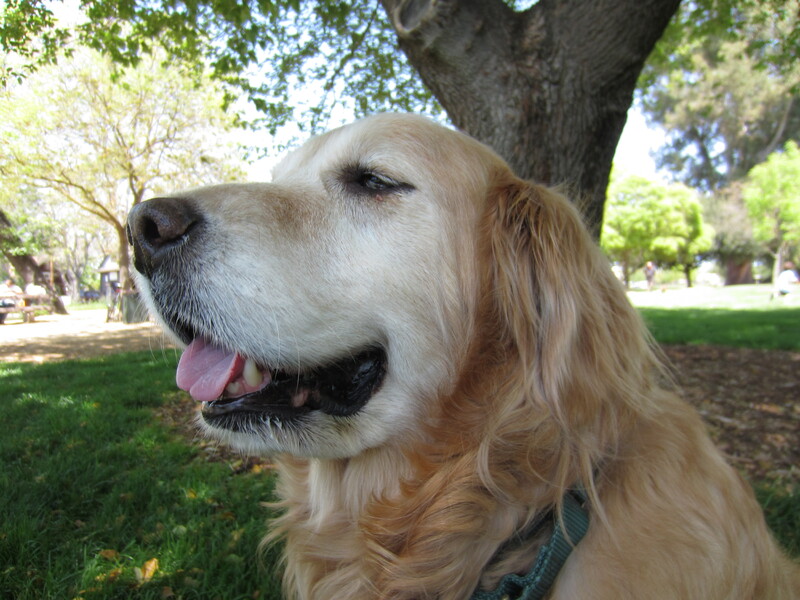 We had a nice walk at the dog park, driving around town, having some ice cream, laying around in the shade. I didn’t cry, although it wasn’t real fun driving her back and giving her a goodbye smooch on that cute blonde head. I’m supposed to go out in about an hour to a music show. Really? At 9:30? I am getting old.